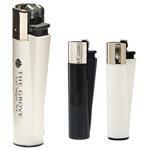 A custom lighter is great for barbeques, camping stores, outdoor sports, retail and more. With your logo imprinted, our promotional lighters will be used hundreds of times. We are also proud to feature Bic Lighters, a name you can trust. If you do not see the custom lighter you are looking for, please call us at 888-332-ADCO (2326) or email us at sales@adcomarketing.com as we have many additional lighter styles to choose from.